In the quest to sufficiently reduce greenhouse gas (GHG) emissions, it is crucial to “get the numbers right.” Failure to do so would, in all probability, mean that the desired reductions will not be achieved. Regrettably, much of what is being proposed is not based upon any comprehensive quantitative analysis, but is rather rooted in anti-suburban dogma. Further, ideologically based approaches carry the risk of severe economic and social disruption, which could make it even more difficult, in a political world, to reach GHG emission reduction objectives. Unconsidered attacks on suburbs could also backfire, setting back more reasonable attempts to reduce emissions over time. For example, a recent New York Times blog entitled “The Only Solution is to Move” presumed it a necessity to (1) move from the suburbs to the city, where (2) “you are near everything you need” and to (3) abandon cars, which the author contends “cannot be reformed.” This screed provides an ideal point of reference. We start with the comparative GHG emissions efficiency of suburbs and deal with the other issues in future articles. The Need for Comprehensiveness: Any plausible attempt to reduce GHG emissions must start with a comprehensive understanding of the issue, including the comparative GHG intensity of various types of living and mobility patterns. This requires a “top down” analysis of GHG emissions by mode and locality. Such an analysis must start with the gross GHG emissions in a nation and allocate each gram to a consuming household. A household allocation is necessary, because businesses emit GHGs only to satisfy the immediate or eventual demand of consumers. “Top down” is required because that is the only way to make sure the analysis includes everything. The typical “bottom up” analysis runs the risk of missing large amounts of emissions as analysts highlight their own “hobby horse” sources, while excluding the inconvenient. This is why we have “double entry” bookkeeping – to make sure that the sums balance. “Top down” comprehensiveness has been best developed by the Australian Conservation Foundation (ACF) Consumption Atlas, which is the only study I have found that allocates every gram of GHG emissions in a nation to households. That is a minimum requirement. Having reviewed the need for comprehensiveness, the balance of this article will deal with residential GHG emissions. Despite all the airtime – and trees – sacrificed for lengthy columns on GHG emissions, it is clear that the state of the research in the United States remains abysmal. GHG Emissions: A Function of House Size: Research has been published that suggests the dominant suburban housing form (the detached single-family dwelling) is more GHG intensive than more urban, multi-unit and high-rise apartment and condominium housing forms. However, the entire supposed city versus suburbs advantage relates to house size. The Department of Energy’s Residential Energy Conservation Survey (RECS) data shows that the energy consumption per square foot is 70 percent higher in residential buildings with five or more units (the largest building size reported upon) than in detached houses. Full disclosure on the part of the anti-suburban crowd would require telling people that their conclusions would mean much smaller house sizes. Common Area GHG Emissions: There is, however, a far more fundamental problem. The databases usually relied upon (The Bureau of the Census's PUMS and the Energy Department’s RCES), as cited in the USDOE 2008 Buildings Energy Data Book, do not provide sufficient information to demonstrate any high-density GHG emissions advantage. None of these data sources include the GHG emissions from “common” energy consumption in multi-unit residential buildings. Their information is limited to energy consumption as directly billed to consumers. Thus, in a high-rise building, common energy consumption sources such as elevators, common area lighting, parking lot lighting, swimming pool heating, common heating, common water heating, common air conditioning, etc. are not included. Detached housing generally does not have common energy consumption. The “common” consumption omission is serious. Other Australian research indicates how inaccurate consumer based inventories can be. Energy Australia has showed that, in the Sydney area, GHG emissions per capita, including common consumption, in high-rise residential buildings are 85 percent greater than in single family detached dwellings. 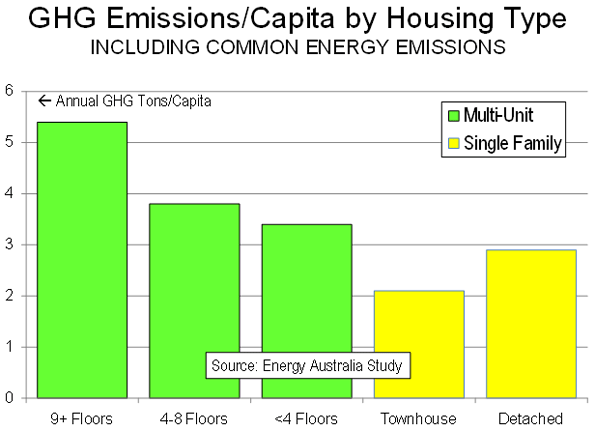 Other multiple unit buildings are also more GHG intensive, while townhouses (row houses) are the best (see Figure). The inclusion of common consumption may be a principal reason why the ACF data associates lower GHG emissions with single family detached housing. Construction Materials: There is a further complicating factor. The materials that must be used to construct high-rise residential buildings, chiefly concrete and steel, are far more GHG intensive than the wood used in most single family dwelling construction. A 1997 Netherlands study indicates that the GHG emissions per square foot of high rise construction may be as much as five times that of a detached dwelling. In the newest energy efficient housing, the same study finds that the GHG emissions, over a building’s lifetime, can be greater than the emissions from day to day operation. The report notes that construction materials will become more important in residential GHG emissions, because improvements in routine energy consumption are likely to be more significant than those in building materials production. Then there is the issue of the GHG emissions in the construction process. It would not be surprising, for example, if heavy cranes could also tip the balance against high-rise towers. Cost per GHG Ton Reduced: All of this raises a question about how to identify policy strategies. The answer is to compare costs. The Intergovernmental Panel on Climate Change suggests that the maximum costs should be on the order of $20 to $50 per ton. McKinsey has published research indicating that steep reductions can be produced in the United States at less than $50 per ton. Yet, the costs of GHG emissions reduction are as absent from much of the present literature as the GHG emissions from elevators in high-rise towers. But costs are important. Economic and social disruption is likely to be greater to the extent that people are forced to change their lives. There is a big difference between requiring people to reduce their emissions where they live versus trying to uproot them – as well as their families and business – to urban cores. The former offers the hope of achieving sufficient GHG emission reductions, while the latter promises to incite a bitter fight between the bulk of the middle class and the regulatory apparatus. All this with a high probability that GHG emissions will not be sufficiently reduced. The Bottom Line: Outside some in the urban planning community, there is no lobby for reducing people’s standard of living. At least with respect to residential development and housing form, this does not appear to be necessary. The common area and construction GHG impacts of high-rise condominium buildings could well be greater both per capita and per square foot than those of detached housing. There is no need to force a move into a futuristic Corbusian landscape of skyscrapers. Indeed, it could even make things worse – for households, communities and even the environment. Regulating People or Regulating Greenhouse Gases? Submitted by peter on Thu, 04/09/2009 - 17:44. Whether the methodology behind the Australian study is valid or not, it's only telling part of the story. A household's transportation-related GHG emissions could be far greater than the emissions coming from their housing, particularly if they live somewhere that requires a lot of driving. If you drive 20,000 miles a year just getting to and from work--which, I might add, is not at all unusual--that's 10 tons of GHG emissions annually. 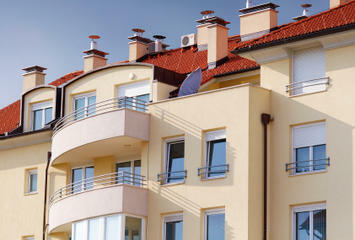 (See this site: http://www.travelmatters.org/calculator/individual/methodology) On the whole it's much more energy efficient to live in urban multifamily housing than it is to live in a car-dependent suburb, if living in an urban setting reduces the amount you drive. The writer makes a great point relating exactly to this issue: "The average Texan consumes approximately 500 million BTU per year, about six to seven times that consumed by a resident of New York City or San Francisco. This dramatic difference is not due to heating or cooling as one may think, although, urban buildings are remarkably more efficient. The difference largely results from level of dependence on the automobile. Metropolitan regions where many people travel by public transportation (or by bicycles or on foot) are inherently more carbon-efficient than places that rely almost exclusively on automobiles, which is to say, most of the United States." As a side note, I don't think energy usage data on Australia is all that applicable to much of the US because we have cold winters. Detached single-family homes require more energy to heat than apartments or townhomes because there is more surface area for energy to escape. I would think that an analysis of GHG emissions for housing in the Northeastern US, for instance, would show very different results than an analysis for Sydney. Submitted by wes on Thu, 04/09/2009 - 14:07. WC: "The Department of Energy’s Residential Energy Conservation Survey (RECS) data shows that the energy consumption per square foot is 70 percent higher in residential buildings with five or more units (the largest building size reported upon) than in detached houses." wes: Could you mislead your readers anymore? Single family homes are quite larger than all other building typologies, so on a per square foot basis they consume "less", as this brings down the average (mobile homes consume the most per sq. footage according to the report, but this doesn't tell us much). In the Building Energy Data Book, it shows that single family (detached) homes consume 108.3 (million Btus) per household and 39.7 (million Btus) per household member. Multi-unit (5 units) consume 53.8 (million Btus) per household and 26.4 (million Btus) per household member. Single-Family detached homes consume 73.9% of the total energy pie for residential dwelling types. On a per unit measure, single family detached homes consume twice that of multi-unit dwellings. More total people generally live in a single-family home, to which on a per household member basis, multi-units consume 33% less than single-family detached units' per household member. These statistics that you use are confusing because it assumes that more square footage saves energy, and that single family homes are somehow energy efficient when compared to multi-unit residences. WC: "There is a further complicating factor. The materials that must be used to construct high-rise residential buildings, chiefly concrete and steel"
wes:You must also factor in the lifespan of such buildings. A steel and concrete building is going to last much longer than a wood frame unit. Sure, analyzing single dwelling units' GHG emissions is important, however the composition of such units and how they function (in an economy) is even more important when analyzing GHG emissions and environmental impact.